Recognize the partners in your returns. Have you ever closely examined your cell phone bill? Typically you just look at the big number at the bottom and write a check. But if you studied it line by line you would see that your bill contains several fees that aren’t going into your actual carrier’s pocket. City telecom tax, state telecom tax, a 9-1-1 service fee… They may seem like small dings here and there, but over time, they add up. These various government entities act as silent partners with your carrier, holding out their hands for their share of the transaction, eating away at your pocketbook. Just as with your cell phone bill, your investment portfolio is vulnerable to silent partners. Ideally, a silent partner would provide some sort of benefit, but in the case of your investments, these silent partners add no value. There are numerous silent partners that take a bite out of realized and unrealized gains on investments. 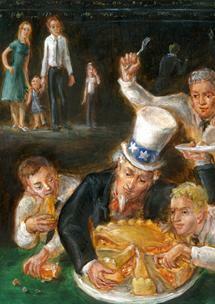 In the painting, titled The Feast, we depict Uncle Same and several others who eat away at your returns pie. 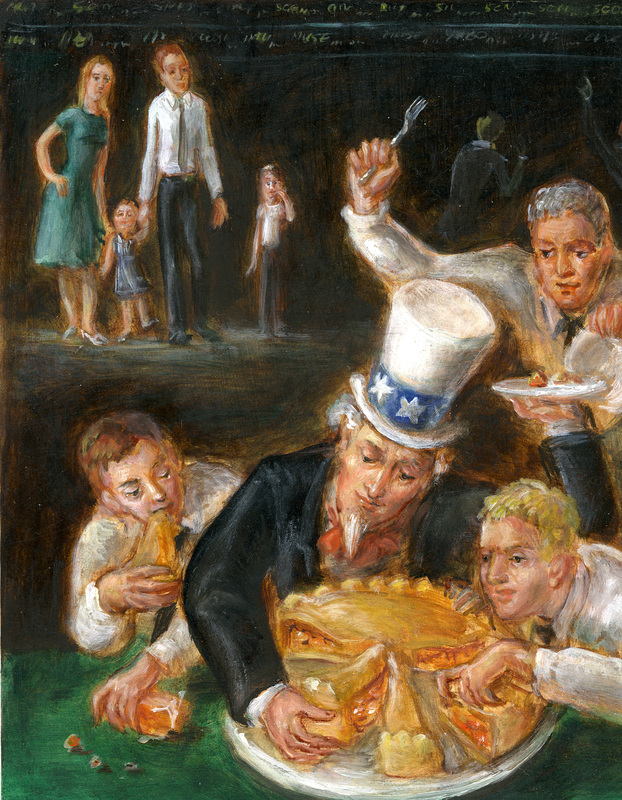 The investing family stand idly in the background looking hungry and perplexed as their wealth is voraciously consumed by many silent partners. According to a 15-year study conducted by Vanguard founder John Bogle,1 investors in taxable accounts kept only 47% of the cumulative return of an average actively managed equity mutual fund, but they kept 87% in a market index fund, as reflected in Figure 7-1. This means $10,000 invested in the average actively managed equity fund grew to $49,000 versus $90,000 in an index fund. That’s a $41,000 drain that pads the pockets of the silent partners in the form of sales commissions, taxes, cash drag, expense ratios and transaction costs. Cash drag relates to the cash balance held in a fund that is maintained for redemptions, and therefore is expected to earn a lower return than the investments. 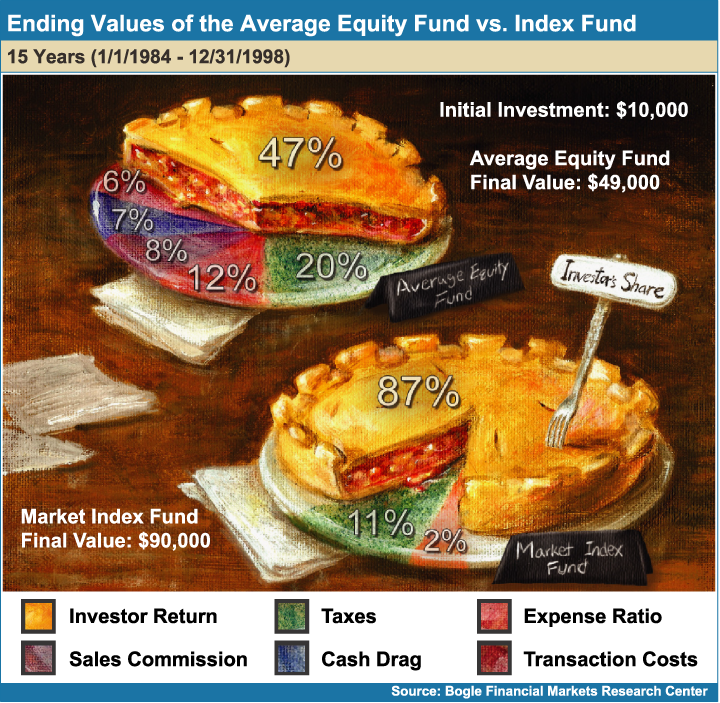 A later study2 by Bogle analyzed the returns and tax implications of the average equity investor vs. an investor in an S&P 500 Index Fund. Figure 7-2 details the end results for the 25 years from January 1, 1981 to December 31, 2005. The chart shows that $10,000 invested in the average managed equity fund would have grown to post-tax results of only $71,700. 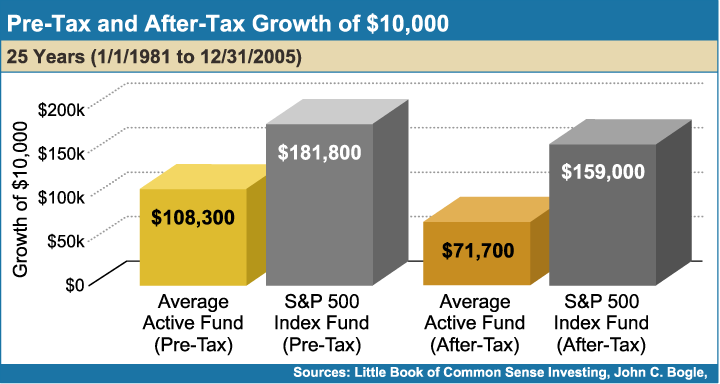 The same amount invested in the S&P 500 Index Fund would have grown to a much larger post-tax sum of $159,000. Figure 7-3 further reveals the contrast between the post-tax returns of both index funds and their respective Morningstar categories. 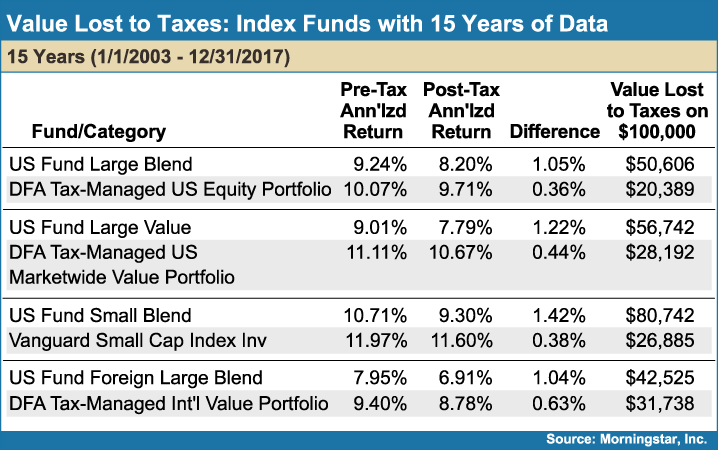 From January 2003 through December 2017, a $100,000 investment in DFA Tax-Managed US Equity Portfolio, lost only $20,389 to taxes, while the Morningstar Large Blend category lost $50,606. Looking at another index at the bottom of the chart, the DFA Total International Index Fund lost $31,738 to taxes, while the Morningstar Foreign Large Blend category lost $42,525. It is important to note that the annualized returns for the Morningstar categories are upwardly biased due to the impact of survivorship bias. 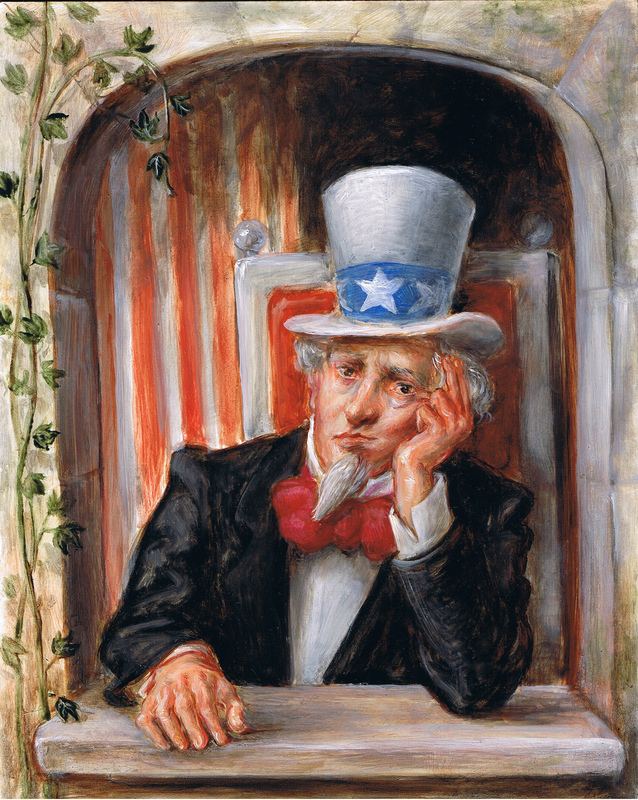 Such contrasts in taxes reveal why index funds investing makes for one very sad Uncle Sam, as seen in the painting. The average active mutual fund has higher turnover rates than index funds, creating tax liabilities that erode returns. Figure 7-4 shows six Morningstar categories, which are primarily actively managed funds, compared to index funds within those categories. Note the large difference in turnover ratios between all Morningstar categories and index funds. 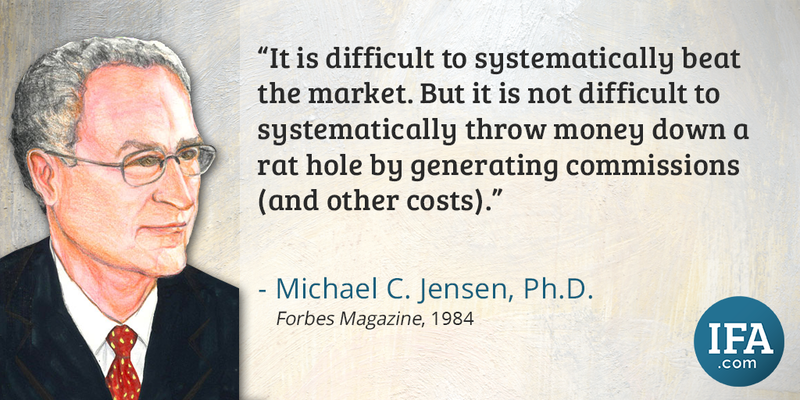 Unlike investment costs and taxes, inflation is an uncontrollable variable. To hedge inflation risk, investors may buy Treasury Inflation-Protected Securities (TIPS) which adjust their coupon payments and re-payment of principal based on the Consumer Price Index (CPI). While TIPS may seem an obvious choice, investors should not forget that free protection from risk does not exist. This protection comes with a lower long-term expected return relative to nominal bonds. A TIPS buyer bets that actual inflation will be higher than the “breakeven inflation” incorporated into TIPS prices. One way to mitigate inflation risk is to keep bond maturities short because market interest rates will reflect expected inflation, and as these bonds mature, they can be re-invested at the higher market interest rates. Another way is to invest in asset classes that have expected returns in excess of inflation. When compared to passive funds, active funds charge higher fees. The cost of a fund’s operation is passed on to the investors. In the case of active fund management, the costs associated with identifying mispriced securities are burdensome. Detailed stock analysis, frequent buying and selling inside the fund, and compensation to the funds’ managers for their perceived skill all add up to impose a hefty fee and a high hurdle for fund managers to beat their benchmarks net of fees. As I have shown in previous steps, active managers rarely beat their index benchmarks. These higher fees are a primary culprit of this underperformance. Figure 7-5 reveals the disparity in mutual fund expense ratios, showing the weighted averages of fund share classes tracked by Morningstar. The figure shows the differences of the average fund expense ratios between actively managed funds, and a 60% Stock/40% Bond Index Portfolio. 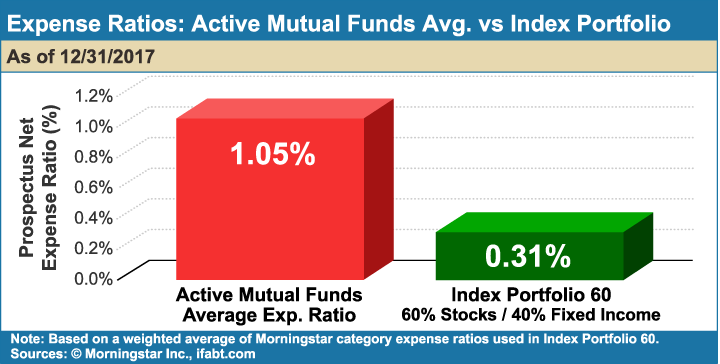 As you can see, the average actively managed mutual fund is more than three times as costly as the blend of indexes. 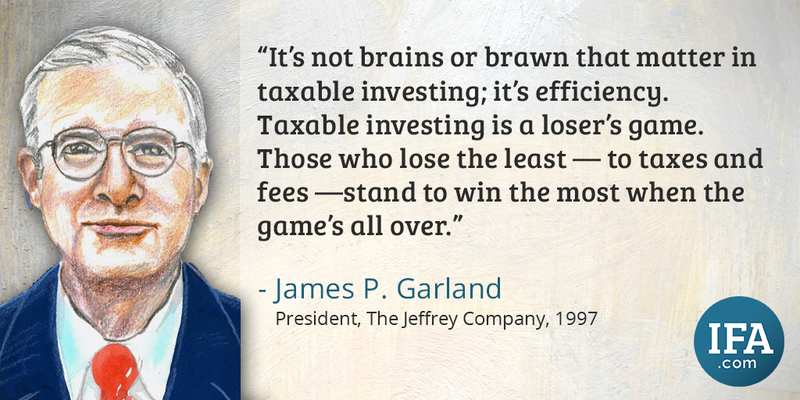 Index funds are tax efficient by their very nature. 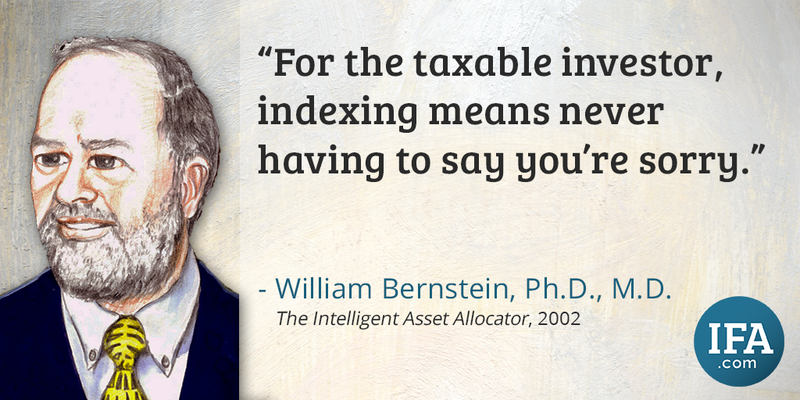 However, some indexes can be further tax-managed to save you even more in taxes. These tax-managed index funds are very efficient in offsetting realized gains with realized losses, deferring the realization of net capital gains and minimizing the receipt of dividend income. 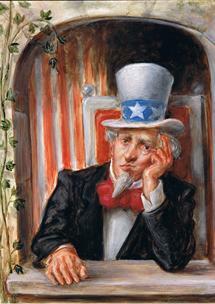 The result is maximized unrealized capital gains that have not yet been realized for tax purposes. Taxes are not paid until a future date when withdrawals are made and the gains then become realized. The benefit is that the unrealized capital gains (profits) remain a growing part of the net asset value of a fund rather than being distributed to the investor. Exchange-traded funds (ETFs) are also a tax efficient way to invest in an index. Index funds are an excellent way to minimize the effect of silent partners. 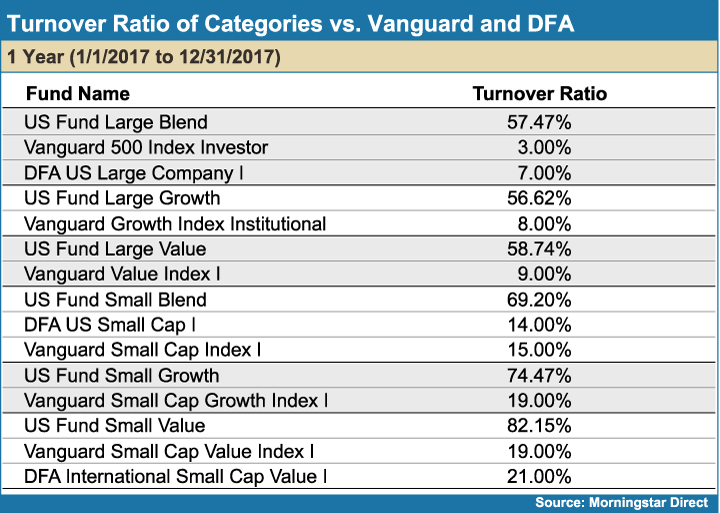 Dimensional Fund Advisors and Vanguard are leading providers of tax-managed index funds with funds in many equity categories. While fees, transaction costs and taxes eat up active investors’ returns, index fund investors maximize asset growth by avoiding the major impacts of costs and taxes. No investment is completely free from silent partners, but passive investors use index funds, tax-managed index funds and ETFs to retain as much money as possible. 1John Bogle, Bogle Financial Markets Research Center, Remarks to the Philadelphia Chapter of the American Association of Individual Investors, November 23, 1999. 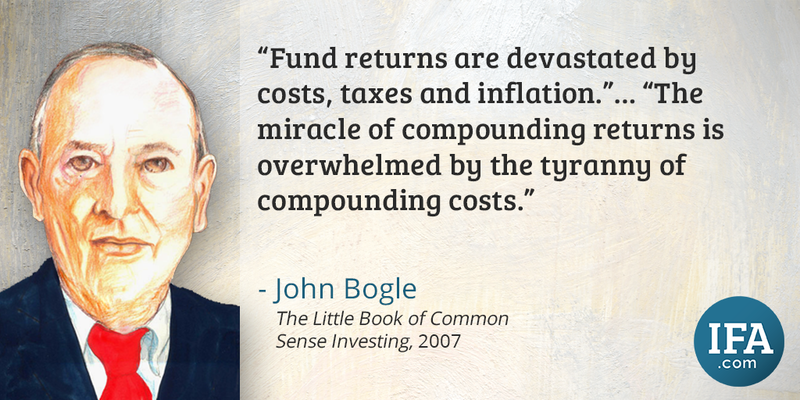 2John Bogle, The Little Book of Common Sense Investing: The Only Way to Guarantee Your Fair Share of Stock Market Returns (Hoboken: John Wiley & Sons, Inc., 2007). 3Joel M. Dickson and John B. Shoven, "Taxation and Mutual Funds: An Investor Perspective," Tax Policy and the Economy, National Bureau of Economic Research, Vol. 9: MIT Press, 1995.